After suffering isolation and persecution during the Maoist era, the Catholic Church in China has reemerged with astonishing vitality in recent years. Richard Madsen focuses on this revival and relates it to the larger issue of the changing structure of Chinese society, particularly to its implications for the development of a "civil society." Madsen knows China well and has spent extensive time there interviewing Chinese Catholics both young and old, the "true believers" and the less devout. Their stories reveal the tensions that have arisen even as political control over everyday life in China has loosened. Of particular interest are the rural-urban split in the church, the question of church authority, and the divisions between public and underground practices of church followers. 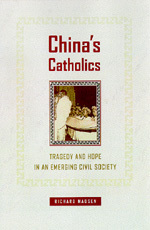 All kinds of religious groups have revived and flourished in the post-Mao era. Protestants, Buddhists, Daoists, practitioners of folk religions, even intellectuals seeking more secularized answers to "ultimate" concerns are engaged in spiritual quests. Madsen is interested in determining if such quests contain the resources for constructing a more humane political order in China. Will religion contribute to or impede economic modernization? What role will the church play in the pluralization of society? The questions he raises in China's Catholics are important not only for China's political future but for all countries in transition from political totalitarianism. Richard Madsen is Professor of Sociology at the University of California, San Diego. He is the author of China and the American Dream (California, 1995), Morality and Power in a Chinese Village (California, 1984), coauthor of Chen Village under Mao and Deng (California, 1992), and coauthor of Habits of the Heart: Individualism and Commitment in American Life (California, 1985).